Many people experience small, dark, cobwebby shapes drifting across their field of vision. These floaters are especially common as people age. 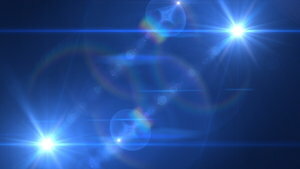 Flashes, a similar phenomenon, are quick flickers of light. Both are usually harmless, but, occasionally, can be a sign of serious eye troubles. Vitreous humor is a clear gel that fills the rear two-thirds of your eyeballs. With age, vitreous becomes more liquid and can form stringy clumps. Tiny cell clusters cast shadows on your retina. These are what you see when you notice a floater. If you try to look directly at them, they float away. When your eyes stop moving, floaters drift around. About 25 percent of people have floaters by the time they reach their 60s. The number of people in their 80s who experience floaters increases to about two-thirds. Very nearsighted people are more likely to develop floaters. Floaters are also more common after eye injuries, after cataract surgeries and in people with diabetes. Inflammation or bleeding in the eye can also cause floaters. Occasionally, floaters result from a torn retina, which is a serious condition requiring prompt treatment. When tiny vitreous fibers pull on your retinal nerve cells, you may sense a quick flash of light. This might also look like multiple flashes over a wider area. Flashes often occur in conjunction with floaters. If you experience flashes, contact your ophthalmologist. Flashes may be a symptom of retinal detachment. 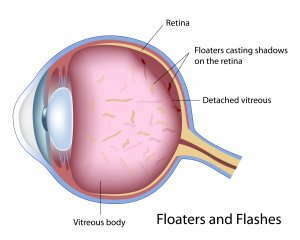 However, as long as your floaters are not related to retina damage, they are unlikely to be more than a nuisance. In time, they could disappear and become less noticeable, or they might stay and become even more annoying. You can try this easy, non-surgical way to get temporary relief from floaters: Look up, down, left and right. This may shift the floater out of your field of vision. Some patients may be suitable candidate for laser surgery to treat benign floaters. Nonetheless, the possible risks of this treatment option should be weighed against the benefits. Concerned about floaters, flashes or other symptoms? Call us today for a comprehensive vision exam. We can evaluate your eye health, help identify the cause of your floaters and / or flashes and suggest appropriate treatment options, based on your individual anatomical, visual and lifestyle needs. "I recommend Eye Doctors of Arizona. The entire staff is always happy, pleasant, and helpful. Dr. Heller is wonderful... always thorough, and accurate. An excellent doctor. I was fortunate to meet his second son, Ben, who will be joining the practice soon. Now with their two offices, it is even more convenient to book appointments."